Growing up, for the first 10 years of my life, my maternal grandparents lived with us. But, it's not what you think. They weren't old, they didn't need us to take care of them. Quite the contrary, in fact my grandma was a mere 49 when my brother was born and 56 when I joined the fam. As retired HS teachers, my grandparents were the perfect people to recruit as live in nanny's for my parents who are both entreprenuers and were busy running their businesses. My mom was still the main chef in the kitchen, but often times my grandma would get dinner ready, or my grandpa would man the grill for his famously delicious lemon pepper salmon, and my dad was definitely known to make a mess of the kitchen from time to time. That said, as my grandparents were the built in babysitters that helped us with our homework and often watched us (since they already lived there!) when my parents went on work trips I got pretty used to my grandma's cooking as well. And despite growing up eating a pretty healthful variety of veggies and different cuisines, it was my grandma's Tuna Casserole that has always stuck with me. Yep the iconic, colorless, one pan meal of the 50's occasionally made it's way into our home and boy was it a fan favorite. On the flip side, my husband grew up in a big family (he is one of five!) four of which are boys and that meant that his mom made a lot of big one pan or crockpot meals so that everyone could serve themselves a hearty portion between sporting events and after school activities. 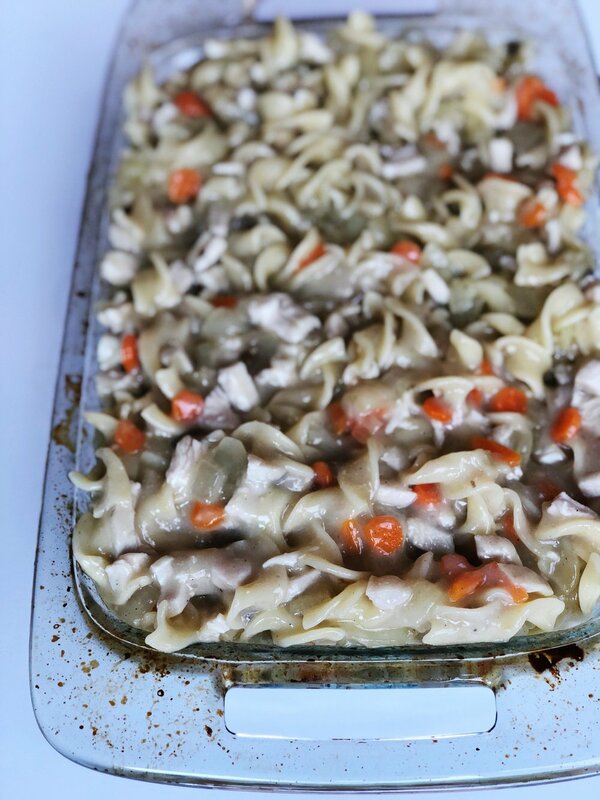 So it's no surprise that one of their family favorites is her Turkey Tetrazzini. It's simple, just like Tuna Casserole, but imparts a bit of nostalgia for those who grew up eating it. So my take on this recipe is a little different from my MIL but it can be easily adapted to suit your taste and what you have on hand. For me it was a no brainer to make because I had a ton of leftover turkey from this pregnancy approved roasted turkey as a way to finally eat a turkey sandwich. Optional: breadcrumbs or shredded cheddar cheese for topping - my MIL actually adds some shredded cheese in teh casserole but my husband doesn't love cheese so I omitted it. While #1 is happening, add the onion, carrot, salt & pepper to a large sautee pan with oil over medium heat. Saute until translucent (5-8 minutes) NOT BROWNED. Add the cup of chicken stock to the veggies, let simmer for a few minutes then turn off the heat. In a large mixing bowl add the cream of chicken & cream of mushroom soup, the chopped/shredded turkey, and your now drained slightly cooled pasta. With a slotted spoon add the carrots & onions and some of the stock to the large bowl mixture. Mix together and continue adding stock if needed to moisten the pasta. Place the mixture in a baking dish and bake at 350 for about 30 minutes or until bubbling. OR cover and place in the fridge until ready to bake. Then bake at 375 for about 45 minutes. Shop the essentials for making this meal on my LikeToKnow.It Page or below!